The Trump International Hotel is a newly redeveloped property that transformed the iconic Old Post Office Pavilion in Washington, DC into a luxury hotel preserving and enhancing the building’s historic features. The Trump Organization, led by Chairman and President Donald J. Trump, restored the building with more than 263 hotel rooms, several world-class restaurants, an expansive spa, ballroom and meeting facilities, a library, a museum, and indoor and outdoor gardens. The Old Post Office’s clock tower, which offers panoramic views of Washington DC, continues to be managed by the National Park Service. The redevelopment began in late 2014 and the hotel opened in September 2016. 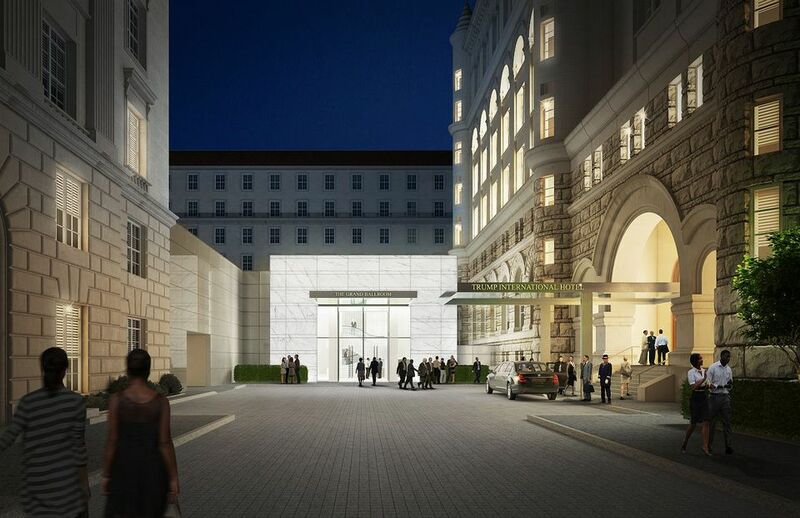 The 11th Street pedestrian entrance on Pennsylvania Avenue was redesigned to serve as the driveway to the hotel’s canopied grand entrance. Inside, the heart of the property is The Cortile, a soaring nine-story atrium that will function as the hotel’s grand lobby and lounge. The ground level includes world-class restaurants and luxury retailers on the corners of Pennsylvania Avenue. The guestrooms average more than 600 square feet, making them the largest in Washington, DC, with lofty 14-to-16-foot ceilings, soaring windows, beautiful existing millwork, and glittering crystal sconces and chandeliers. The bathrooms feature six-foot tubs, wood vanities with rich marble tops, and polished brass hardware. The 35 suites include the Trump Townhouse with its private entrance on Pennsylvania Avenue. At 6,300 square feet of interior space, it is the largest and most luxurious suite in Washington, DC and among the largest in the country. Two Presidential Suites are located in the historic former offices of the Postmaster General. With 16-foot ceilings and views of Pennsylvania Avenue and the National Mall, each suite offers unique amenities such as separate dining room with pantry and service entry, his-and-her walk-in closets, private sauna and steam room, two-person shower, and VIP direct-elevator access. The Trump International Hotel offers a total of 39,000 square feet of meeting and event space, including a 13,200-square-foot Grand Ballroom. Presided over by internationally renowned developer Donald J. Trump and his three grown children – Donald Jr., Ivanka and Eric – the TRUMP HOTEL COLLECTION™ includes the highly acclaimed Trump International Hotel & Tower® New York, Trump International Hotel & Tower® Chicago, Trump International Hotel™ Las Vegas, Trump International Hotel™ Waikiki Beach Walk®, Trump SoHo® New York, Trump Ocean Club® International Hotel & Tower Panama, and the newly opened Trump International Hotel & Tower Toronto®. TRUMP HOTEL COLLECTION is headquartered at Trump Tower, 725 Fifth Avenue, New York, NY 10022. To learn more, visit www.trumphotelcollection.com/developers. Built in 1899, the Old Post Office building was designed by Willoughby J. Edbrooke, Supervising Architect of the Treasury Department in the Romanesque Revival style which was inspired by 11th and 12th century architecture. When completed, it was the largest office building in Washington, the first federal building on Pennsylvania Avenue and the first government building to have its own power plant. In 1914, the DC Mail Depot was moved to a building constructed next to Union Station (now housing the Smithsonian National Postal Museum) to take advantage of the many rail connections. In 1934, the office of the Postmaster General moved to a newly constructed office building in the Federal Triangle building project between Pennsylvania Avenue and Constitution Avenue. For the next forty years, the Old Post Office building served as overflow space for several government agencies. In 1971, the building was saved from demolition by a group of local citizens who fought to save it (now the DC Preservation League). In 1973 the Old Post Office was added to the National Register of Historic Places. In 1978, the building was restored as a shopping destination and to house the offices of the Advisory Council on Historic Preservation as well as the National Endowment for the Arts, the National Endowment for the Humanities, the President's Committee on the Arts and Humanities, and formerly the Institute of Museum and Library Services.